PRIOR TO ACCESSING THE SITE, PILOTS MUST REQUEST PERMISSION TO FLY and PAY £1 per pilot to Mr McTear at Bewaldeth Farm (see photos and Map Ref: NY210347) NO PERMISSION - NO FLYING. See photo of Farm. The site entrance gate may have a combination lock, get the code from Mr McTear. Note that this site is our only one completely within one field and it has multiple stakeholders; apart from Mr McTear (and his farm animals) there are DEFRA, Natural England and the RSPB. Hence access must be carefully managed if the CSC are to retain use of the site. Avoid the NW end of the site during the nesting season and if model aircraft flyers are using it. TRAINING: Note that this is an essential site for training and schools using the site have priority. While there may be scope for other pilots to fly, Mr McTear may limit numbers and qualified pilots may be denied permission even though training is taking place. Please graciously respect the landowner's wishes. BINSEY: This is the large hill SE of the take off on Whittas Park. It is an active grouse moor with a gamekeeper and owners who actively oppose wildlife disturbance...... Please DO NOT LAND OR TAKE OFF FROM anywhere in the whole fenced Binsey area, at any time! DOGS: No dogs allowed on the flying site without permission. A small site which works better than its size would suggest. This site is very user-friendly, with a flat top and large open landing area. Hence it is a key training site in the area. Fair conditions allow the crossing to Binsey to be made so increasing the scope of the site. "Bewaldeth is one of the classic jewels in the CSC’s crown. It was where the first hang gliders flew and CSC pilots owe their thanks to the farmers, first George and now Leslie, for their continued kindness and support over the years and long may that continue. Many of us learnt to fly at Bewaldeth and others will continue to do so given good co-operation & communication between the pilots, clubs and schools involved in managing the site and by respecting the farmer's wishes." Centre of Bewaldeth village, about 1 mile south of the access road to the site. The site is visible from the A591 just North of the village of Bewaldeth. Coming from Keswick, look for a campsite entrance on the left, just after this turn right through a gate into a field. Please park on the hard standing by the old motor cross track. If this is full then please DO NOT park on the grass as the ground is very soft and muddy. If there is no space then park near the Lakes camp site, by the main road and walk up the track. A short walk-up of about 10 minutes. Avoid the direct route up the gap in the gorse bushes. Walk up to the right. Note permission to fly MUST ALWAYS BE OBTAINED and a £1 per pilot fee paid before accessing the site, see restrictions. When the wind is off to the West, it can become turbulent, especially over the gully to the right of takeoff. Please ensure you comply with the site restrictions! Avoid the direct route to take off up the gap in the gorse bushes, instead please walk up to the right. Easy grassy take off area. The bottom landing is uneven with a slight downslope. Excellent big flat top landing area behind take off. 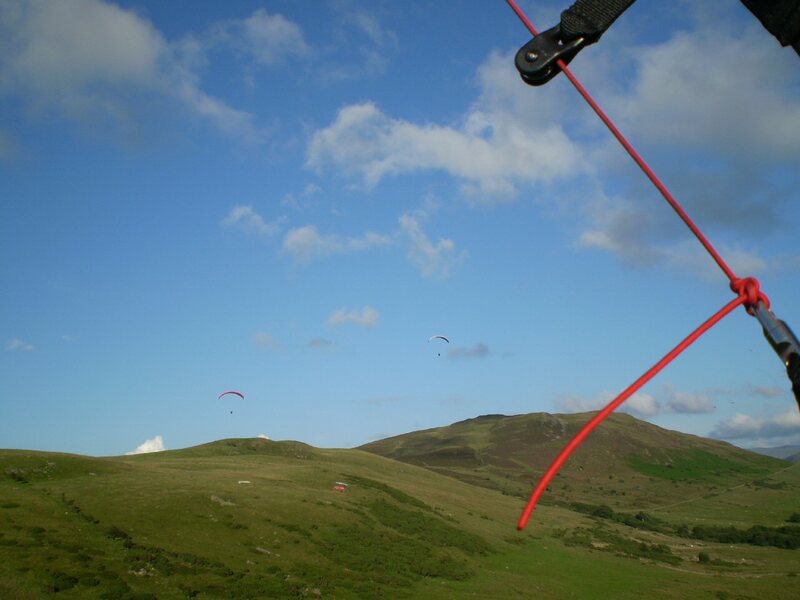 A very useful site which can sometimes be flown when poor conditions, such as low cloudbase or stronger winds at higher altitudes, put the bigger sites out of bounds. When schools are using the site, experienced pilots should take off to one side or the other of the main take off area, and give student pilots plenty of room. 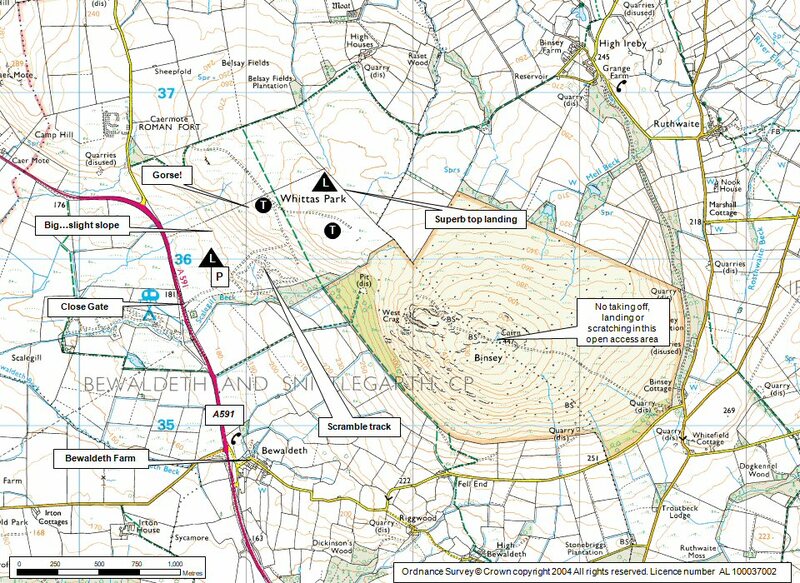 During the nesting season (end March - end July) avoid the NW end of the site (past the beck on the north end of the ridge) as there are nesting curlews; if possible don't land, walk or scratch there so as to give the birds plenty of space. The site is a good thermal producer making it easy to get away over flat ground downwind.The area has minimal restrictive airspace downwind. Possibly underestimated potential, as pilots are likely to use other sites on the best days. 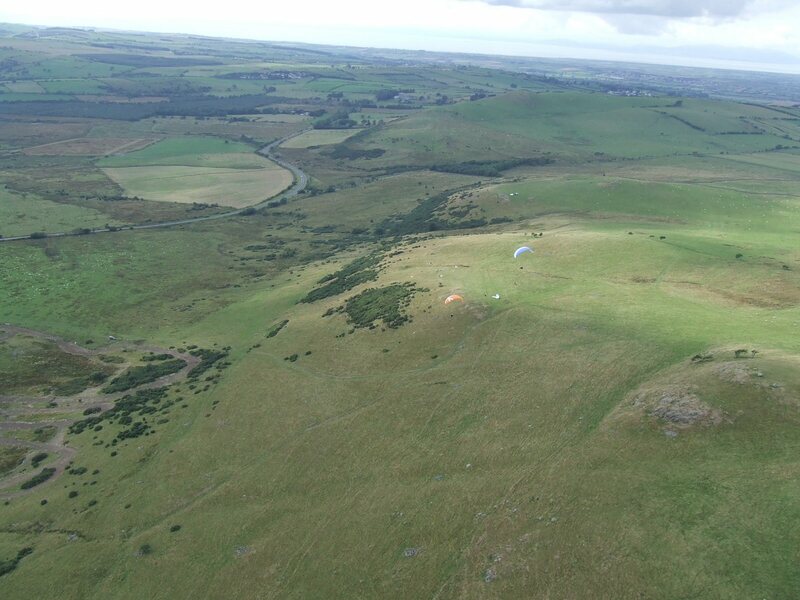 Hexham is the current record set by Pat Holmes in the 90's, a flight where he never got above 1,500ft AGL! 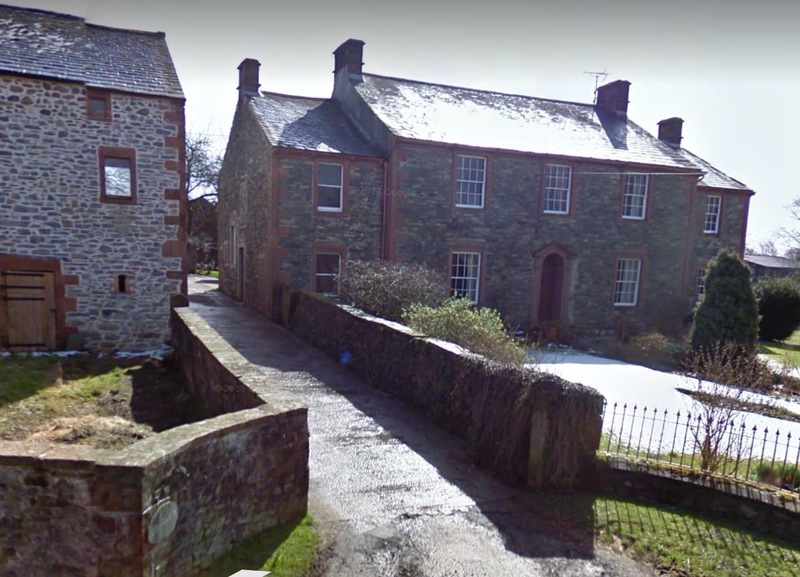 Bewaldeth Farm. Go round to the back of the house and knock.